Looking for a compact solution for powering electronics? 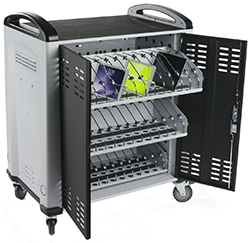 These tablet charger carts create a safe space for a large quantity of laptops, phones and other mobile devices. Classrooms in schools and colleges can use them to hold important learning tools for students. 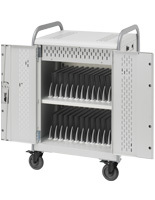 With their high capacity design, the tablet charger carts, or iPad storage stations, can support a number of businesses and environments that require a number of gadgets. Offices can easily store supplies for employees while recharging their batteries and preventing theft with their secure locking design. 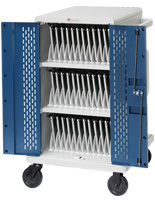 Hospitals and medical centers can also utilize these tablet charger carts to hold their valuable workplace appliance. 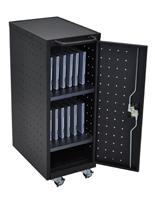 With a number of different features, these racks will be able to meet the needs of any user. What makes these iPad storage stations an excellent choice for powering mobile devices? 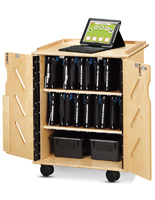 These tablet charger carts are made of strong materials like steel, plastic and wood. Each unit features ventilation holes to prevent laptops from overheating while they're being recharged. For security in public locations like hospitals and schools, most of the tablet charger cabinets shown here have a locking design that prevents unauthorized access. This protects mobile devices from being stolen. In addition to locking models, open designs are also offered here for trusted workplaces and offices. 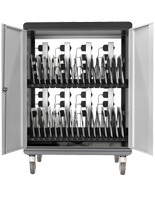 Our selection of iPad storage stations features mobile casters. Offered as floor standing trolleys, the portable fixtures are an excellent choice for locations that need to transport laptops and electronics to different rooms. As previously mentioned, these iPad storage stations have a large capacity for electronics, ranging from as little as 12 to as many as 42. This allows the fixtures to accommodate the largest of establishments and departments, equipping as many students or employees as required. This difference also allows smaller offices to purchase cheaper models that fit their size without having to spend on a bulk holding units. When ordering from our selection of tablet carts, it is important to make sure the cables match. Some fixtures include multi-outlet power strips while others feature USB power ports to recharge touchscreens. Another benefit that is found on our different models are LED indicators that tell the user the status of each gadget. In addition to powering touchscreens, many of the racks can also sync with a computer to put the same settings on each one. Both low- and hi-tech options are available to serve every business. 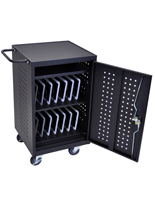 These tablet carts are ideal for organizing and protecting laptops and other valuable belongings. Whether it's for the home, office or healthcare center, our open and locking racks are available for bulk pricing. With quick shipping, MonitorStandsNow is an ideal resource for secure multi-device storage units.